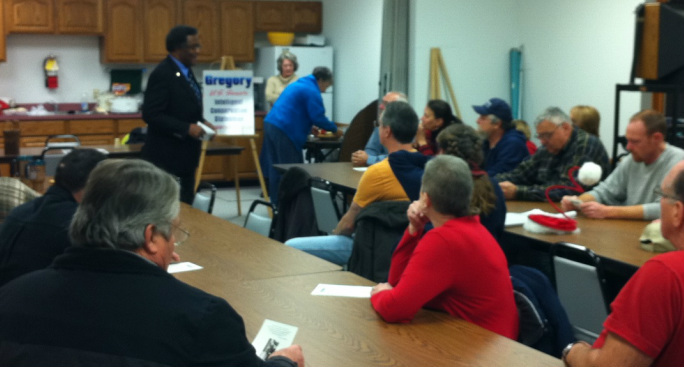 Republican U.S. Senate candidate Eric LaMont Gregory addresses the Preble County Liberty Group. Preble County Liberty Patriots read about US Senatorial candidate Eric LaMont Gregory, while the candidate answers questions. Butch Peelle, David Wolfe, Debbie Williams, Norma Achor and campaign Aide Dan Gallion Tea Party Liaison for the Gregory Senatorial Campaign pose for a photo after Butch Peelle spoke to The Clinton County Tea Party on behalf the Gregory Campaign.